Stamp a Sweet Impression: It's Grillin' Time...Are You Ready? It's Grillin' Time...Are You Ready? 'Cause I'm ready! The warm weather is here and that means it's time to get together with friends and family and enjoy summer and the outdoors. I wanted the invitation to look like an apron and I found a pattern online. I tweaked it a little to suit my design though. I used supplies from the Father's Day Key Ingredients because I really like the checkered patterned papers for this project. For the invitation I started by stamping the grill with Memento Tuxedo Black ink onto Choice Buttercream cardstock. I coloured it with copics and used one of the metal sheets from the Boys Will Be Boys Bundle for the grill body. 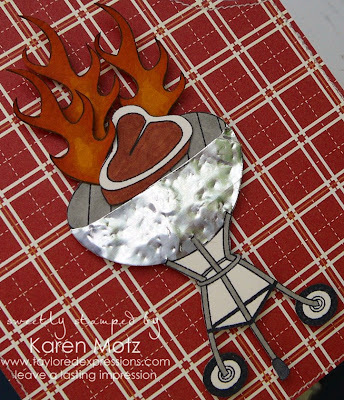 Next I stamped and coloured the steak and flames then I cut everything out. 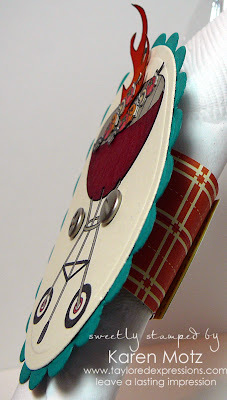 By the way, I really enjoy cutting out, so there's a lot of it in my project...wink! 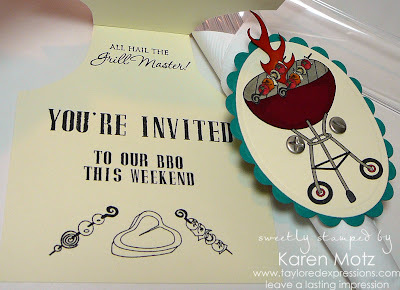 I kept the front of the invitation simple so the grill would really shine (pardon the pun!). All I added was a little sewing around the edges and the ribbon. I left the ribbon loop rather long so I could hang it on my friends' front doors instead of just leaving it in their mailboxes. For the inside of the invitation I used the JustRite Rectangle Stamper with the Brayton Font Set and created my invite. I intentionally left the date off so I could write it in when we decide on our grillin' date. I love having things like this in my stash...ready to go at a moments notice. For the place setting, I found these fun polka dot paper plates at Target, along with the clear plastic square plate and the cutlery. A napkin ring seemed like a logical accessory and it was super easy to create. Once the image was stamped and coloured I cut it out with oval Nestabilities. I attached one of the patterned papers from the Father's Day Key Ingredients to the image with screw brads then wrapped it around the napkin. I couldn't resist adding the shish-kabobs and another flame. The final surprise is on the clear square plate. 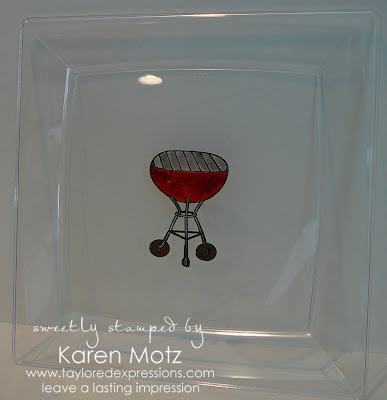 Because it's see-thru I figured why not stamp the BBQ on the underneath of the plate...nobody would expect it! I stamped the image with Versamark and embossed it with black embossing powder. Then I "coloured" it with a mixture of diamond glaze and reinkers. There's no risk to the food because the image is on the under side of the plate. I can't say how durable this will be over time, but I think I'll be hand washing these plates! So now you can be ready for grillin' season too! And don't forget to sign up for the Taylored Expressions newsletter so you're "in the loop" when news breaks about new products, specials and inspiration. You'll find the mailing list sign-up on the TE homepage here. HOly Moly awesome! LOVE it!!! 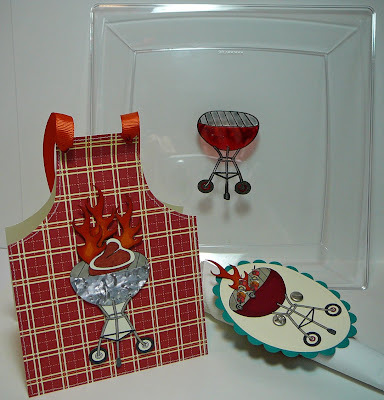 What a great little BBQ set you have designed!! 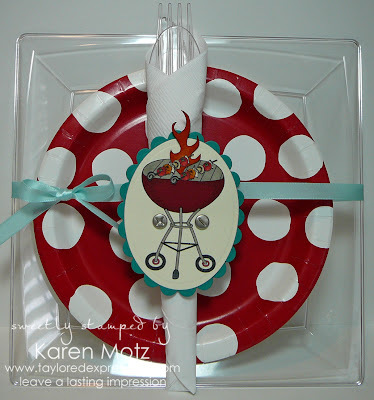 !Great idea with the grill stamp under the plate!!! LOVE IT! AND I am with Leslie - I am ready to come over so just let me know!!! Ohhhhhhhh my WORD.....SERIOUSLY...napkin rings, place settings, apron invitations, and a STAMPED PLATE?!! AMAZING!! Holy moly, can I come to the party?? Oh Saucy...could this set be any more fabulous??? I think not! WOW WOW WOW! I want to be invited to that barbeque...that's for sure!!!! This is just adorable! LOVE the addition of the BBQ on the bottom of the plate. Great job! What an AMAZING project. I love it! Very cute Karen! Fabulous set you have created!!! Karen, this is over the top! FAbulous project and that plate is way cool! what a fabulous project - so fun!! WOWZER, those are so awesome! I love them all!